What A big, beautiful weekend! Strawberry picking, tIme shared with Kelsey, dyeing Easter eggs with the twinkies, an Armenian Easter feast, celebration of new beginnings for dear friends and a trip to Herb Island. I hope you all had a fantastic, laughter filled, delicious weekend too (just check out the food below)! Happy Easter, Happy Weekend friends! 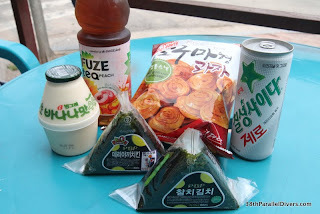 Wait, is there such a thing as the perfect summer day in South Korea? Typically a summer day consist of heat, heat, oh yea more heat, and throw in some major humidity! Today however was absolutely perfect! Yes it was HOT but we were able to get out and enjoy it with some new friends in Dongjeom. Dongjeom is only 7km (5 miles) away from Dongducheon and is very popular among Koreans on days like today. If you viewed the pictures already you will see that we cooled off in a stream. We loved it! We were the only Americans there and the Koreans welcomed us right away. For as little as 50,000 KRW you got to order/grill all sorts of great foods, have your own personal cabana-style set up all day, park for free, and soak in the rays. We were surprised at the soaking of rays part because usually Koreans avoid exposing there skin to the sun at all costs. There was a sweet Korean family that squirted us with water guns and got into a splash fight with us too…. (Don’t worry we learned a valuable lesson recently and we safe guarded the camera from water with our lives). Meaning Mrs. B took one for the team and got soaked! After some time spent cooling down we decided to towel off and head to Herb Island. Those of you familiar with our past blog post know that we have been there multiple times now. Each time we go back we see or try something new. This time we can add blueberry herb ice-cream, boy’s in bubble, full body chair massages, and tasting herbal teas to the list. 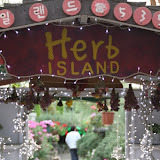 We are telling you that you’ve got to visit Herb Island if you are ever in the neighborhood. As an answer to a previous post question, YES, Herb Island sells pre-potted herbs and flowers, so bring some won. The prices seemed reasonable. After Herb-Island our stomach’s were all grumbling. Our new friends asked if we wanted to join them for dinner and we gladly accepted! We drove into New City (Dongducheon) and went to a place that we have wanted to try out from our numerous night walks. The restaurant is Twae Rang Such Ur K/Go K/GI. Such means basically to grill or charcoal, and K/Go K/GI is the meat. We were all impressed with the Kal-mege-Sal (We might have butchered that spelling, many apologies). Basically we had seasoned meat that was not oily and grilled perfectly right at our table! We had sprouts, kimchi (and this kimchi would be a perfect beginners kimchi to try, not too much fish sauce), rice, and bean soup. Mmmm! We left stuffed and will definitely go back again! We both got home saying what a fun filled day we had with such awesome company. We look forward to many more great adventures into the future with them both! Herb Island isn’t really an Island? It’s Friday night, Hmmm what to do? What to do? Why not go check out Herb Island? That is exactly what we did! Herb Island located in Pocheon, Gyeonggi-do. South Korea. Herb Island is only a few miles north of Camp Casey the Army military base in Dongducheon. It’s not actually an “island” so do not be fooled by looking for an actual island. However, there are so many sights, tastes, and aromas to take in when you visit this peaceful place. Here are basic directions if you are traveling by car like we did- In Uijongbu, take road 3 that leads to Dongduchon. After driving past Dongduchon, keep going until you see road 344. Seeing road 344 that goes to Chosongri, turn right and go straight until you see Samjongri Elementary School. Herb Island is behind the school. When you make it to Herb Island you will be greeted by a worker at the bottom of the hill where you will have to pay a very small entry free. Then prepare yourself for a short steep uphill drive to get to the parking lot. Woo-Hoo! You have now made it to Herb Island! When we first arrived we immediately went inside the greenhouses. Here we loved following the long paths through each twist and turn and smelling and taking in all the flower and plants had to offer. This is a great area to take all sorts of pictures. Next we headed into our first shop. This shop had all sorts of little trinkets and crafts. We started to take a picture but we were quickly told that we were not to do so. Oops. We found this place to be neat because they were selling handmade candles, and furniture pieces to fill a dollhouse. After checking out the first shop we walked down a hill made of all uneven stepping rocks to where they had a small animal petting farm. After checking out the animals we headed over to the stage area that is surrounded by a waterway where you can take little swan boats or get inside of a giant plastic bubble and run on top of the water. This looked hilarious. Larry tried to convince me to try it out, but I wasn’t having any of that craziness. All I could picture was a hamster on a wheel like trying to get somewhere fast but not being successful. We then found ourselves in front of the herb-island museum. This place was pretty neat! We walked around a bit checking out the history and such. We both fell in love with some of the photos that were handmade with herbs grown on the site to form a large picture. The price was a bit steep hah so we stuck to just admiring them for the time being. We were both really ready to eat dinner after the trip inside of the bakery. We grabbed dinner at a sit down restaurant located within Herb Island called the aroma-eating village. Everything featured on the menu is served with herbs. Even the water is refreshing with hints of lemon balm, rosemary, and a teeny bit of sugar. We both ordered bibimbap, as we explained in previous blog entries as a traditional Korean dish typically with rice and vegetables. This bibimbap is a special blend of seven herbs and has a sauce on the side that is made from 16 others. It’s so neat you just mix it all together adding however much you want of the sauce and rice and eat it. We took a few pictures of the dish so you could see what it looks like. The dish is served with sides of kimchi and a warm broth. Herb Island also has a library, an aromatherapy room, and another more formal restaurant on site. Oh and I can’t forget about Larry’s favorite – The full body massage chairs. He raved about them the last time he went to Herb Island. If you are ever in the area or want to get out of the city and take in the mountains and fresh sents of herbs we suggest that you check this place out! Friday night was a perfect time to visit as we are told that weekend days such as Saturday and Sunday are packed. Please feel free to check out our pictures or the Herb Island Official website: http://www.herbisland.net. We scanned the below items in from a flyer obtained at Herb Island (Sorry it’s not the best quality).